Ask someone who doesn’t watch a lot of hockey what a hockey player looks like. Odds are, they’ll say they don’t have teeth, or they are bruised and beat up. That’s because sometimes it’s actually accurate. Hockey is a brutal sport and that’s half the appeal, right? That’s part of hockey – using your body to block shots, taking pucks to the face (not always by accident), full-speed bone-crunching body checks against your opponent, checking opponents against the boards or getting a stick shoved in your face as a sometimes legal form of defense. It’s part of the game. And if you want to play the game, you’ve got to be tough. No question. Take a torn ACL for example. In the NFL, the second a player goes down, their season is done. Sometimes sadly even their career. But in the NHL, it’s a little different. Like when Anaheim’s defenseman Francois Beauchemin played with a torn ACL for the last month of the Ducks’ season. Imagine that – an entire month playing with a torn ACL. Whether or not that’s a smart move for an athlete isn’t the question, the point is – that’s hockey. Battling through a tough injury is almost as warrior-like and praiseworthy as scoring a goal. Oh and lets not forget taking a blade to the face. That’s not for the faint of hearts either. Remember back in March when Red Wings forward Drew Miller took a skate to his face (nearly missing his eye)? 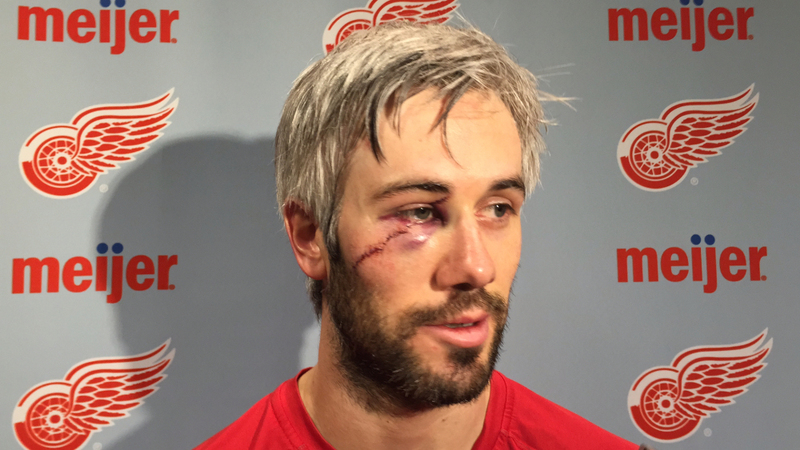 That injury required 50 – 60 stitches and Miller was back on the ice just 16 hours later. Miller isn’t the only one who was back the day after a massive stitch-up. Back in 2014, Martin Havlat was back on the ice the very next day after receiving 40 stitches for a gruesome cut on his head. Hockey skates are brutal – they cut a lot more than faces. Brayden Schenn knows that very well, when he took a skate to the stomach, leaving a nasty gash. This CBS article reports that after “quick repair,” he was back on the ice. There aren’t many other sports that would even entertain the idea of a “quick repair” to such an injury. Check out this incredible article at RYOT by Annette Irwin for even more player injuries – ones that seem season ending, but they’re not. She lists pages and pages of player injuries that didn’t keep them off the ice for even a day. It’s almost insane really. The Sportster also lists their picks for top 15 “toughest” hockey players to play the game here.